New to hunting? You may have a million questions in your mind so let's gather the most popular ones and get you started. Beginning something new can be fun and scary at the same time. When it comes to hunting, if you aren't raised into the sport, it can be overwhelming but it shouldn't scare you away. When you begin, most places require you to have completed a hunter's safety course. Information in the course will give you the basics on safe use of firearms, treestand safety tips, the benefits of wearing hunter orange, and may also guide you into some basic tips and tricks for hunting. Aside from the basic pamphlets, first-time hunters can sometimes find themselves leaving the course ready for the field with false confidence or a complete nervous breakdown. Many hunters, like myself, enjoy sharing their experiences, stories, and knowledge of the outdoors to others. Mostly, we enjoy sharing the sport of hunting in itself. There are many reasons we hunt, but that's a topic of discussion for a rainy day. Today, we are looking to answer some of the basic questions many first-time hunters have, who want to hit the field and hunt. Have you ever asked these? Could you answer them if a new hunter asked you? 1. Where can I hunt? Here is a question that is sort of open ended. If you are not lucky enough to have private land to hunt, you have to do what the majority of hunters do, and that is hunt public land. Finding public land may be easy if you know what you are doing. Finding quality public land however, may be the difficult part, but there are various ways to find hunting property available to you. The first and most reliable way is to contact your local state's regulatory hunting body, usually a Department of Natural Resources (DNR) or Wildlife Commission. For most of the questions you will have in relation to hunting regulations or the "dos and don'ts," getting help from your local officials is your best bet. Many states have online maps available for their public land. In New York State, most hunters will call these properties "State Land" as the public land is owned by the state. Other places, such as Maryland or Pennsylvania, have county owned property available to hunters. Pennsylvania and many other states also offer WIHA, which is Walk In Hunting Access. That may or may not be on local DNR websites, however there are resources available to you to find private land owners who allow access to hunters to hunt their property. The other option, which is becoming quite popular today, is the onXmaps app. This app has helped many hunters find properties that may not be public information readily available at other locations. The app forms a color-coded system that shows boundaries and locations belonging to federal, state and local municipalities, as well as private land owner information. This app, although usually fairly accurate, is not always 100%, so be sure (with any system you use) to confirm your findings before entering and hunting any property. 2. Is there a good time to hunt or a bad time to hunt? Another vague question for the hunters to answer, but a great question indeed. Most hunters find that deer movement has many factors. Weather, wind, temperatures, moon phase, and food sources... the list goes on. All of these things can be huge factors in suppressing or initiating deer movement. Most hunters find themselves having the best luck the first and last thirty minutes of daylight. In the early season you will find with warmer weather, deer like to be in their bedding area before the sun comes up. Many times they will be in the transition of getting their winter coats, which helps retain heat during the winter months. During the late summer, early fall however, deer find this winter coat and the warm weather to suppress their movement and hold them to nighttime feeding patterns. Your best times in the early season is in the evenings however, as the cool weather inches its way in and the rut comes into play, deer can be on their feet anytime of the day. The hunters who spend more time in the stand and those who can pull an all day sit will tell you the best times are the morning and evenings, but never hinder your opportunities to just those times. "You can't kill them from the couch" is what my father used to always tell me, and that couldn't be any more true. My father also used to tell me that the only bad time to hunt was when my mother wanted him home. You can make your own decisions with that advice. 3. Does scent control really matter? Yes. Although depending on who you talk to, and I have witnessed it, those who are not worried about scent control have still killed many deer. I'm talking about the guys who smoke cigarettes or cigars while on watch. Also the blue collar, hard working men and women who leave their day jobs and try to get in the treestand for the last couple hours of daylight, with little care as to how they smell. They are still killing deer. However, I have witnessed (and filmed) several opportunities vanish due to lack of scent control. Always remember, old and big bucks do not get that old by being dumb. They are the sneaky, smart whitetails that use every bit of sense they have to outsmart us hunters. 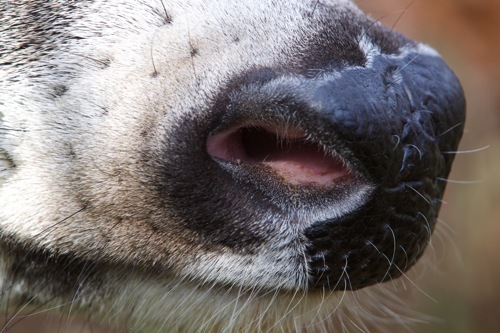 A deer's nose has 800 times more olfactory receptors than humans. They also have great memories which allows them to remember your smell. Similar to the smell of your mother making fresh baked chocolate chip cookies as you walk into her house, a deer will not forget. Technology has advanced so much within the industry in camouflage as well as ozone, like Scent Crusher's new ozone system. The products are designed to not just mask the scent, but kill the bacteria that causes the odors. That leaves you with, basically, scent free clothes. It's a proven technique, but when it comes to human odors, it's always smart to wash and sanitize with odor cleaning products. Camouflage and apparel that can be used as gear, like Sitka's Whitetail line, can help benefit hunters in scent control as well. Sitka designed a polygiene layer which uses naturally occurring silver salt that safely inhibits the growth of odor-causing bacteria and fungi. This helps tremendously in killing the odors as opposed to covering the odors. Cover scents can work as well, however many hunters will tell you if you can kill your odor as opposed to covering it, you will be better off. Overall good tactics to use include wearing a rubber sole boot, finding comfortable hunting gear, and always trying to stay downwind of the animal you are hunting. Too many times I've had my thermals and wind direction change on me, ruining my chances on some great whitetails. I may have the video footage to prove this, but at the end of the day, that is all I have. Unfortunately sometimes you just can't control the wind so it's best to control your scent. 4. How do I know where to sit watch when I'm hunting? The simple answer would be that it comes with time and experience. The complex answer: it depends on the location, surroundings, time of the season, and so much more. There is no good answer to this question because there is never one answer directly capable of answering it. When you want to know how to get from point A to point B and you are using Google Maps, it may give you the fastest route or the route with the least amount of distance. Many times it will give you several options, but ultimately it gets you to the same end point. With hunting, there is no main street direction to follow. There also is no quick direction to follow either. Hunting has many ups and downs and will require a great deal of patience. For those who are willing to learn, the reward is much greater than those who are just plain lucky. To find deer, you have to put in the work and effort it requires to be successful. Many successful hunters will tell you that they spend three to five times more time on scouting, than they do actually hunting. The layout of the land, food sources and water sources are vital information to finding deer, but also it goes without saying, if there just aren't deer there, you won't see deer. So you will need to find a location, food sources, potential bedding areas and get out and scout the land. Look for deer droppings, game trails, try to locate and find deer themselves and then when it comes time for hunting season, sneak in there, be patient and wait for the opportunity to unfold. 5. What do I do after I shoot the deer? The hunt is only half of your mission, tracking and harvesting your animal is what separates lucky hunters from successful outdoorsmen. In a timeline fashion, there are many steps you should do after you have placed a shot on an animal. Immediately following the shot, you should keep your eye on the animal until you can no longer see it. When you last visibly see the deer, make a mental note of where that was. Be sure to use any type of markers that the animal was near when you last saw him. Markers could be a large rock or an odd looking tree, or maybe an opening in the wood line. Maybe you last saw the deer go directly underneath a unique looking branch. Regardless, remember that location in your mind. If the shot was a good shot and you believe you hit vitals, give the deer an hour or two to succumb to the shot. This will give you the best opportunity at finding the deer. If you aren't patient, you risk moving in on a deer that may not be dead yet, and if a deer has clotted up and takes off running, you may now have a deer that has no blood trail and your success rate at finding this deer just decreased tremendously. If you hit the gut or placed an otherwise bad shot on a deer, you will want to give the deer at least four to six hours to succumb. Many times if the temperatures are cool enough, you can choose to leave it overnight and search the next morning without risk of spoiling the venison. Follow up your shot and look for blood. If you are bowhunting, try to find your arrow and decide what the blood looks like on it. If the arrow has dark blood, it could indicate a liver shot. Bright red blood or blood that has bubbles in it could indicate a lung shot. On the contrary, if you think the shot was bad or if you are unsure and find an arrow with green or brown colors on it, mark the location and wait at least four to six hours before going any further. When tracking the animal, take your time. Do not get ahead of yourself because you can risk the chance of stepping on blood or indications that would normally allow you see the direction in which the animal has gone. Many times deer will head downhill and away from the area in which they were shot. Sometimes, if you cannot find the animal, looking in nearby creeks, rivers, or any body of water could help you find your game. Many times injured deer will seek out these water sources when injured. When a blood trail decreases, it's always best to have someone help you search. Always mark "last blood" and slowly make your way forward, looking for the next sign of blood. Many times in the past I have had to get down on my hands and knees searching for the tiniest drops of blood. Just yesterday, a member of our hunting team shot an elk in Colorado and never had a drop of blood to track it with. He used a grid system and never gave up, which is what helped him find the animal and complete a successful trip. This will help you if you run out of blood. Square off the location and form smaller squares to search within. Be sure to take your time and never give up, success comes with hard work both in life and in hunting. Of course it is always nice to have luck on your side but to give yourself and the animal the best benefit, educate yourself as much as possible, practice shooting your weapon and most importantly, enjoy your time you spend hunting.